This Smoky Mountain cabin is beautifully packaged with a king size bedroom suite! 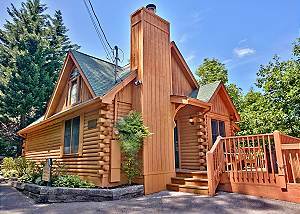 This log home has a private hot tub, foosball, internet access,... VIEW NOW. The 68th annual Spring Wildflower Pilgrimage runs from Tuesday, April 24th to Saturday, April 28th, which is the peak of the spring flower season in the Great Smoky Mountains National Park. There are 165 programs taking place over the four days, with most programs conducted on the trails in the park. There are also some evening talks that take place at the event headquarters, the Mills Conference Center in Gatlinburg, TN. Please note that all of the programs are held rain or shine! The Spring Wildflower Pilgrimage consists of a wide variety of outdoor programs in the Great Smoky Mountains National Park where you can learn more about trees and shrubs, fungi, ferns, medicinal plants, birds, insects and of course, wildflowers! The professionally guided nature walks also provide a unique insight into the park’s history and cultural resources. There are even night walks where you can go on an “Owl Prowl” to learn about this predator of the night or a “Bat Walk” to learn about how bats function in the ecosystem. Some of the other available programs include topics such as wildflower photography, nature journaling and land navigation with maps. The Spring Wildflower Pilgrimage is an extremely popular event so it is recommended that you register as soon as possible! You can register for the event online or register in person at the Mills Conference Center starting on Tuesday, April 24th at 5 PM. Keep in mind that you can register for the entire event or just for one day. The registration costs for adults are $50 for one day and $75 for two or more days, while students are just $15 for one or more days with verification at the on-site registration. Children who are 15 and under may register for free when accompanied by a registered adult. Stay close to the Spring Wildflower Pilgrimage programs with a vacation at Acorn Cabin Rentals! Our beautiful cabins are just minutes from the event headquarters at the Mills Conference Center and all of the fantastic attractions of downtown Gatlinburg! While staying with us, enjoy gorgeous mountain views, bubbling hot tubs, game rooms, theater rooms and all other types of awesome amenities. Whether you want a 1 bedroom cabin for a romantic getaway or a 5 bedroom cabin for a large family, we have just what you need for a fun vacation in the Smokies! Check out all of our cabins in the Smoky Mountains today to plan your vacation to attend the Spring Wildflower Pilgrimage! We look forward to seeing you this spring at Acorn Cabin Rentals!